You are here: Home / General Finance / A Bank that Pays Down your Student Loans? Online banking is practically standardized these days. SmarterBank is no different, coming with all the features you want. You get an online checking account with no monthly fee for active users, a SmarterBank Visa ® Debit Card (with a network of over 40,000 free ATMs), free checks, free online bill pay, and more. Their banking services are provided by The Bancorp Bank, the same bank behind PerkStreet and Simple. SmarterBank, however, distinguishes itself with SmarterBucks, their free rewards program. SmarterBucks allows you to earn rewards on the money you’re already spending. But here’s where things get interesting: SmarterBucks rewards become extra student loan payments that are used to automatically pay down any student loan you choose, whether it’s private or federal. And redemption is automatic. Every month you have an earned reward balance of $15 or more, they’ll make an extra loan payment on your behalf. It’s a value proposition we’ve never heard before. And it’s one we like. Traditional rewards programs offer points or dollars you use to purchase something. 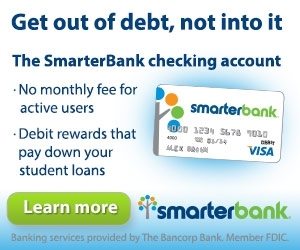 SmarterBucks, on the other hand, uses those rewards to pay off your student loans faster. This actually increases the value of the rewards you earn. Here’s how: if you earn $15 in SmarterBucks and contribute that toward a student loan, you’ve not only paid off $15 in debt, you’ve avoided paying accruing interest on that $15 for the rest of your loan’s repayment period. Depending on your interest rate and where you are in your repayment period, your $15 payment could reduce the total cost of your debt up to 2-3 times that amount. 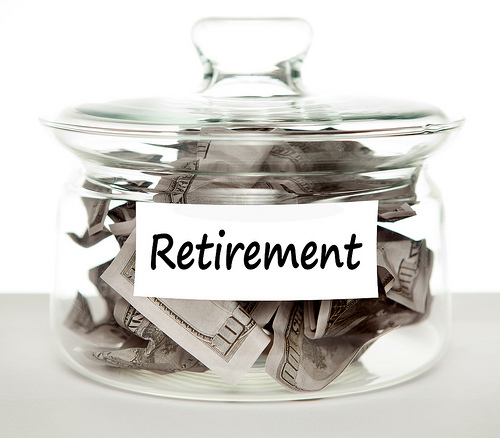 They harness the power of interest to make your rewards worth more than they’re face value. It isn’t just a good idea. It’s a brilliant one. Plus, earning rewards is easy! With SmarterBank, you can earn rewards on everyday spending like groceries and gas, or coffee, or movie tickets, or restaurants. You get the idea. You get rewarded for the spending you already do. What’s better than that? Or earn bonus rewards in the SmarterBucks Marketplace by shopping with your favorite brands, including the Apple Store, Target.com, Banana Republic, J. Crew, Groupon, and more. You can even invite family and friends to contribute directly to your rewards balance via their credit or debit card. That means things like birthday presents, Christmas gifts, or any other special occasion can help you get out of debt faster. What’s even better? Come February, SmarterBucks will be giving you the power to have what they call Giftersââ”people who sign up and use SmarterBucks to earn rewards on your behalf. Basically your family and friends can soon earn rewards on the money they’re spending then give those rewards to you. SmarterBank and SmarterBucks are brought to you by the team at SimpleTuition, a company that’s been dedicated to college affordability since 2006. They’ve already helped millions of students and families better afford their college education by teaching them to search and compare student loan options. Now they’re helping those same students get out of student debt faster. Now go sign up for Smarter Bucks! Save Big with an Entertainment Book!